Let’s discuss Lisbon. In a word: underrated. Vastly, but thankfully. I’ve never been more pleasantly surprised by a city. Lisbon treated me well. She received me with an open embrace, loosened my knots, and cooked me a good dinner. Never have I been in a major city and not been immediately concussed by a wall of stimulation, whether it be the smell, the rigor, the lack thereof, the life. But when we arrived in Lisbon, and rode a taxi to our hostel, the sounds and smells and sights of the city introduced themselves to me in sequence with polite greetings. They didn’t holler at me from across the street, grab me by the wrist, or shove my face into the cement. 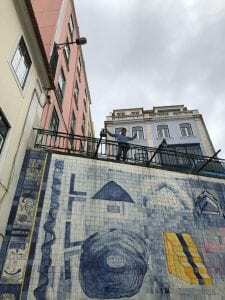 Instead, Lisbon let me discover it, and all its idiosyncrasies, as the days went on and I wondered its narrow alleyways and climbed its many many hills. That’s probably the one critique I had about Lisbon: there’s too many hills. If you thought the hills in Ithaca were bad, well they were most certainly modelled after Lisbon’s. But even then, climbing each one was a delight, despite the persistent assault on my weak ankles and terrible knees. It’s almost as if Lisbon is self-aware, and knows that its not the easiest city to get around, and so makes up for its less than ideal topography with artisanal pavement layouts, winding staircases carved into the streets, and panoramic views at every turn. Also, there’s no open container policy in Lisbon (revolutionary, I know); therefore, I helped myself to a beer or two at sunset atop one of the many vantage points. One night, I ate dinner outside this little café dressed like a residential home with little knickknacks arranged haphazardly alongside each other. None of the furniture matched and on each table was a whimsical lamp and a used book. I know, pretty frickin cheesy, but the food rivaled that of Rome. I also happened upon one of the coolest, and most authentic flea markets in Europe, where I bought earrings for my mom and matching bracelets for my brother Alex and I. Buying jewelry for my mom is always a high risk investment because she has an almost untarnished track record of disliking the pieces I buy her. There’s still an unworn golden heart locket collecting dust somewhere in her sock drawer. I gave that to her for Christmas when I was eight. These earrings, however, are two of the most beautiful things I’ve ever held and they were only eighteen euros. In each one, there’s a singular pearl sitting like a lily on a pad made of sterling silver. She better wear them because, if she doesn’t, I certainly will. Despite the extreme terrain, Lisbon is very much a seaside town. All the major public plazas are oriented towards the ocean like a row of doors facing central park. And so, in this way, the ocean is very much an essential part of the city fabric. From these descriptions, you might deduce that Lisbon and San Francisco share a few key characteristics, in which case, you’d be right. Lisbon even has a golden gate bridge of its own, with a park-like area called Belem, which is basically a strip of boardwalk along the bay lined with museums and monuments as well as picturesque views of the bridge and the hills beyond. I spent an entire day walking this strip and had an amazing time. I could talk about this city for days, but I’ll stop here.